Forget steamed Christmas pudding. 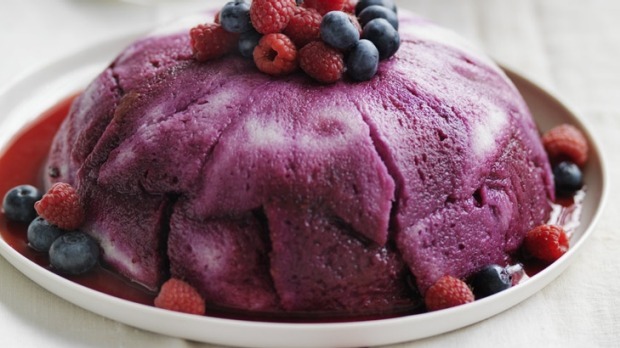 Summer pudding is easy, and berries are in full swing. Combine the berries (reserving a few raspberries and blueberries), 200g sugar and 3/4 cup water in a medium pan over a low heat. Stir gently (don't let it boil) until the sugar has dissolved. Simmer without stirring for 5 minutes or until the juices are released from the fruit. Strain the juices from the fruit and set both aside. Lightly butter a glass bowl (about 3-4 litre capacity), sprinkle with a little caster sugar and shake away the excess. Cut half the bread slices into triangles, leaving the rest in squares. Line the bowl with the triangular slices around the bottom, packing them firmly to cover the whole base. Line the sides of the bowl with the square slices, overlapping them slightly. Place the fruit in the bowl and pour over enough juice to nearly cover the fruit, ensuring the juices seep though the bread. Cover the top of the fruit with more overlapping triangular slices and pour over more juice to saturate the bread. Place the bowl in a larger dish so as not to spill any juice, cover the pudding with a flat plate that fits perfectly on top and set a weight on top (such as a tin of tomatoes). Refrigerate overnight to allow the pudding to set. To serve, unmould the pudding and serve it with double cream and reserved berries.